This is a very old guitar from David’s collection, dating from the 1930’s. It was also used on live performances of "Smile" and "Then I Close My Eyes". 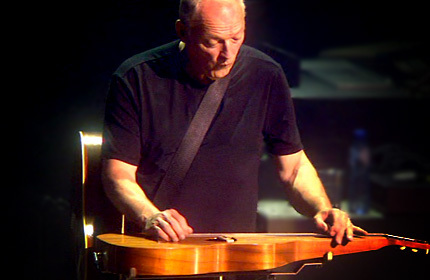 The guitar has an open Em tuning E B E G B E.
At 1:52 in a backstage interview during the Rollings Stone's 2003 Licks tour, Ronnie Wood says that he uses this hollow body, California-made lap steel "for the softer numbers like 'No Expectations'." No reviews or videos yet for Hermann Weissenborn Hawaiian style acoustic lap steel. With an Equipboard account you can rate this item, add it to your collection, submit a review to discuss what you like and dislike about it, and associate Hermann Weissenborn Hawaiian style acoustic lap steel to artists that use it. Create an account!